Our lovely CiP team had a 2nd transnational meeting in the middle of September, straight after the European Permaculture Convergence. Placed on a hillside above lake Bolsena we were enjoying magnificent views and impressive thunderstorms while discussing progress of work in our project. We were very happy to see the development of our communication strategy. We are getting closer and closer to our logo as well as improved design of our website. Not to mention more clarity on how we will deliver interesting posts on our Facebook page. In terms of session plans we have managed to get a lot more clarity on how the session plans will be designed. We are excited that in each session plan we will address observation as well as learning for the head, heart and hands. Besides that the flow of each session plan will follow the pattern of germination (grasping the attention of a child), growing (core activity) and harvesting (the feedback). Last but not least we have made steps forward creating the case studies. We now have 7 drafts (one per partner organisation), each describing a unique story of bringing permaculture to children, schools, teachers and parents. We are looking forward to share with you our stories, which will be available in English, Czech, Italian, Slovenian and Romanian language. This is also an opportunity for you to help as we need support in volunteer translation. Please share your details in this form (link) and we will come back to you. 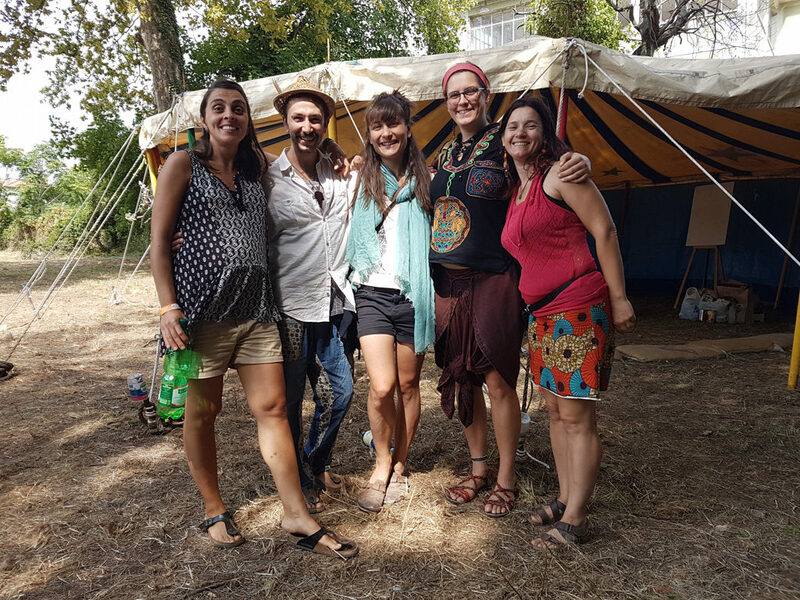 The Children in Permaculture- CiP project team participated in the European Permaculture Convergence in Bolsena, Italy from September 7th to 11th. 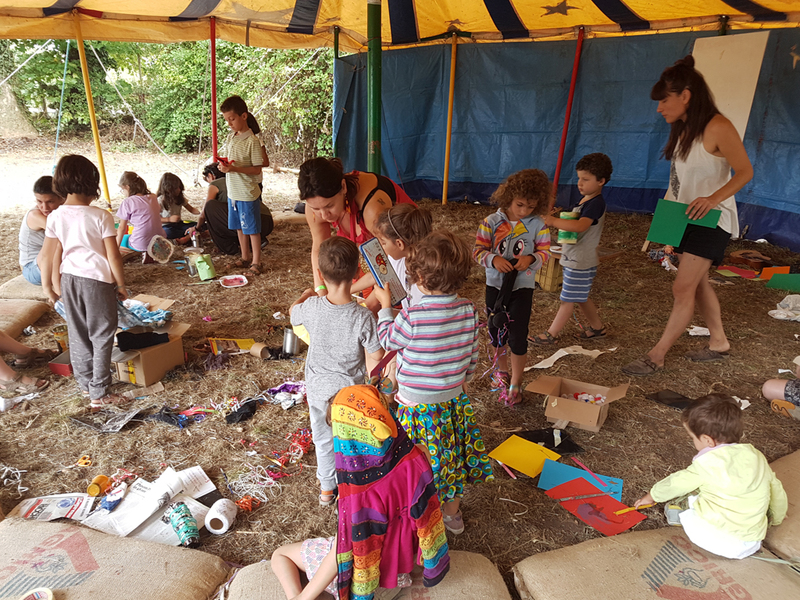 Within the inspiring and extensive program of the EuPC, the CiP team took care of the children’s area, a safe space where every morning the youngest EuPC’s guests could spend their time having fun while practicing the permaculture principles. Children in Permaculture is a 3 year project funded by the European Union’s program Erasmus +. CiP aims to develop educational resources to engage children from 3 to 12 years of age in permaculture. The children’s area at the EuPC in Bolsena took place in a beautiful park in front of the lake surrounded by abundant trees and flowers. The volunteers of the EuPC put up a very welcoming circus tent which created the safe and fun space for running the activities. The team proposed a combination of active games in which children got to move freely within the big park, and creative workshops in which they were invited to explore the area and collect natural materials to create masks, totem animals, musical instruments and other amazing crafts. The music was another important element of tribe building, uniting Italian and international kids who now know “Volevo un gatto nero”, one of the most popular kids’ song in Italy as well as improvisations imitating insects and animals. The CiP area at the EuPC was also the occasion for adults to share their knowledge, games, teaching techniques and expertise with each other. Many professionals and adults from different countries came to propose their activities, songs and stories, enriching and making special this time devoted to fun, learning and playing. The peak of the success of the project was when little Amalia said “I can’t wait for tomorrow morning, to come back here and do permaculture!”, and again when Gabriel said “I really feel like being at home here”. Of course the main insights and teachings came from the kids, like when Luis answered to a song refrain which asked “What’s on the leaf?” saying there is a “pattern”! Many children who came to the CiP area were from Bolsena village itself, representing the positive links between the convergence and the local community. During the program of the EuPC the CiP team proposed a presentation of the project, a great occasion for all the interested people to network and know more about the project and future steps. 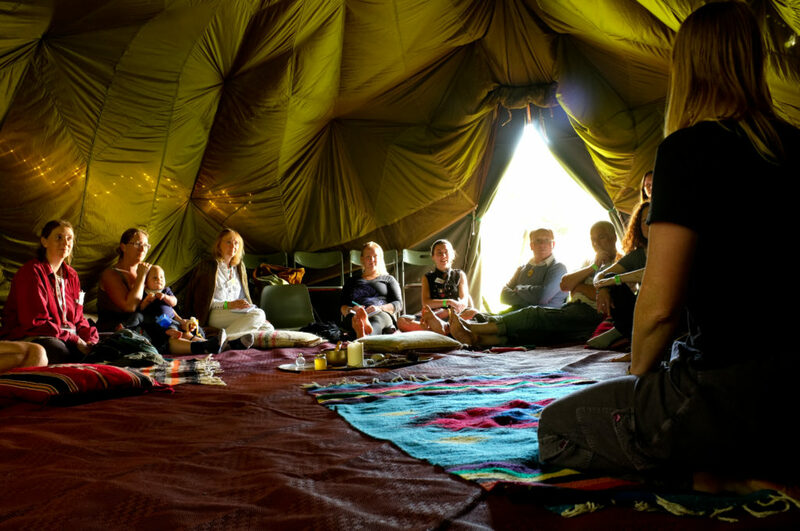 Children became forest guardians in this year’s UK permaculture convergence in Ilkley, Yorkshire. Children in Permaculture volunteer Niamhue Robins integrated learning from last year’s International Permaculture Convergence into how this year’s children’s area was run, receiving excellent feedback from children and parents. Children were engaged through theatre and art, in activities ranging from den-building to foraging, from pond-dipping to music-making. For adults a workshop about Children in Permaculture involved approximately 40 people who learned about the project’s design, celebrated our achievements and explored how to engage children in permaculture in different settings. Nadia Lawton gave a short presentation about an award-winning school garden in Jordan. The film about this school garden project is one of the resources which we reviewed in our Survey of Resources, you can read the Survey here or watch the film here. In August we tested the first draft of our session plans during one week holiday camp for children in the Czech Republic. 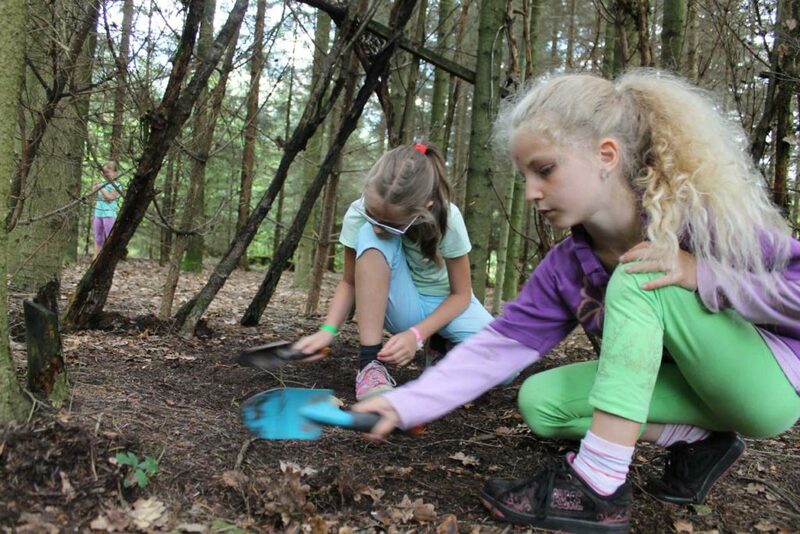 The camp called „The Earth at your palm“ took place in south Bohemia, 22 children aged 7-13 were involved. Each day of the camp the children were virtually travelling to the different places and climatic zones of the world (arid, arctic, rain forest, ocean). The aim of the travelling was to meet 12 different animals (3 in every climatic zone) and through different kind of activities get hints from them how to design and construct the „ideal“ house for humans. In each zone children explored one theme relating to housing (water, energy and insulation, biomimicry, waste). The last day of the camp was a big surprise, because children in the middle of the desert in Africa realized that they are out of sources – the oil well was empty. So they gave all the materials they collected during their journeys to the locals and had to put a big amount of time and effort to get back home again. At home they had to redesign their attitude. In the forest they started to look around for local materials and resources they can use to construct their own „ideal“ house. The children turned up to be very creative. In groups they designed and constructed the energy efficient houses built from natural and local sources, producing minimum of waste and friendly to the Earth and people as well. you can help us with translation of the case studies to one of those languages. Please share your information and interest in this form (link) and we will come back to you. Facing globalenvironmental problems and being confronted with horrible news in the media kids and teens often feel discouraged and tend to think, that they can‘t do anything about it. In this workshop we invite teachers, educators or others who work with children and young people to exchange their experience and develop ideas how children can participate in designing their own living environments, becoming active change-makers for sustainability and regeneration. To do this we get to know the tool kit of permaculture. Originally invented as a concept for regenerative land use, permaculture has become a holistic and integrated design approach to tackle the economic, social and ecological challenges that we are facing. The staff from the environmental education station „Heinershof“, where the workshop takes place, will bring in the experiences, they and the children had during their 2016 project „Hey, lets dream up a field“. During the year, a film has been made showing the work of the project groups starting with the dreaming and planning phase all the way to the realised „Kindergärtnerei“ (children’s garden) – including all the other ideas that came up and were woven together like a spiders net during the year. The workshop wants to encourage and to empower its participants to redesign the places where they work together with the children and youngsters they work with – making them living places for us and coming generations. Facilitator: Judit Bartel works as a Permaculture Designer, pedagogue and cultural anthropologist in the Permaculture Academy Germany. With her education work she inspires and accompanies people to become active and effective in working for a „grandchild-suitable“ world using the tool kit of permaculture.